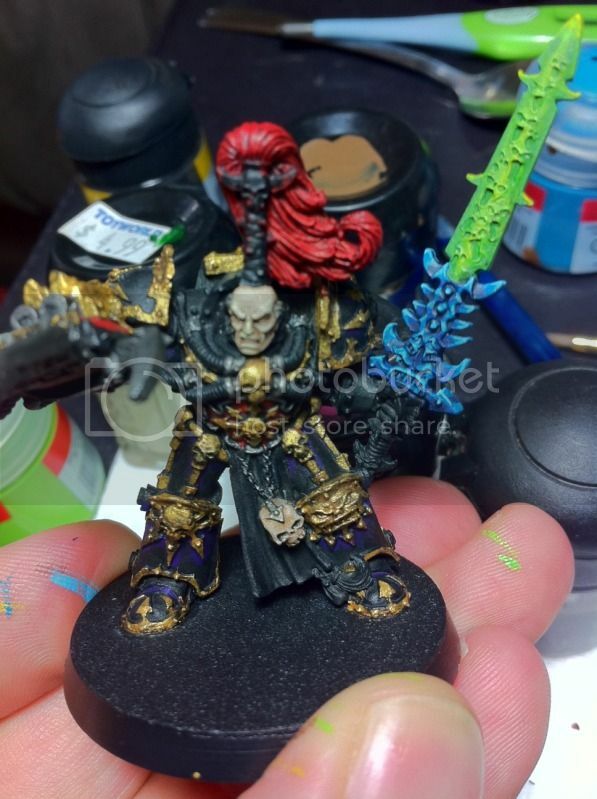 Very quick update today- Abbadon was in dire need of some paint before the weekend, as Ash is also attending the "Final Fifth" tourney at Goodgames and will be using him. So, with some spare time in between painting Orks i managed to lay down some basic colours as well as getting his sword blade pretty much done. The photo didnt turn out exactly how he looks, there's a lot more "pop" in RL compared to the pic but its fairly representative of where Im at. The trim is all Burnished Gold, with a Devlan Mud Wash, with a few bits picked out in Boltgun metal that are washed with Badab Black. I did his face in one of the whitey stone colour Foundations (cant remember the name?) with a wash of Gryphonne Sepia followed by selective applications of Devlan and Badab to provide shading and depth here and there. Pretty happy so far. Hoping that he'll be able to crush some mortals come Saturday, as his last outing was the 40,000pt Apocalypse last year where he really didnt get to do anything.